Investigators at the Ohio Bureau of Workers’ Compensation’s Special Investigations Department wear many hats. When they’re not digging into casework, conducting surveillance or researching leads, they’re either educating the public about workers’ compensation fraud or learning how to advance their skills to become more effective in the future. 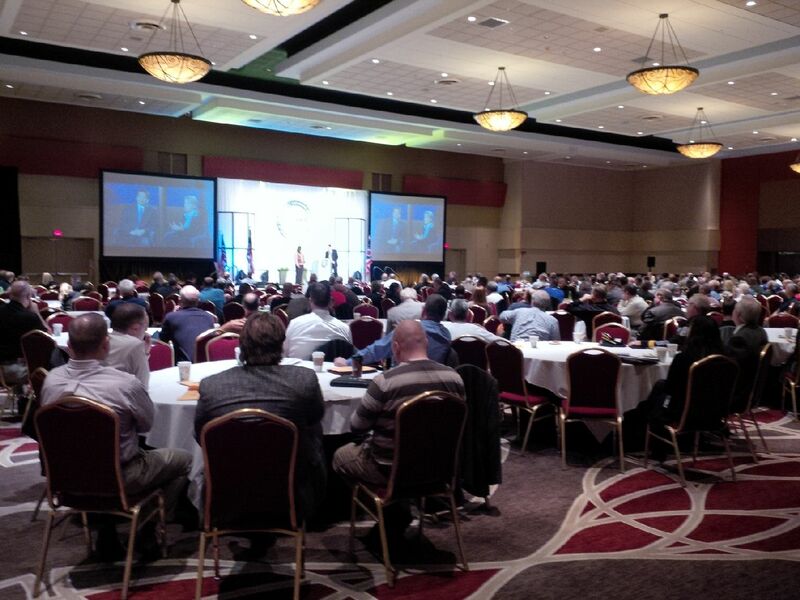 Earlier this week, for example, more than one dozen SID professionals attended the Ohio Attorney General (OAG) Law Enforcement Conference 2014 here in Columbus. Ursel McElroy Drake, deputy director of education and policy for the Ohio Attorney General’s Crime Victim Services Section. Social Media Evidence: What is There and How Do I Get It? presented by Michael Sullivan, assistant U.S. attorney, U.S. Attorney’s Office. Having completed the productive two-day conference, the investigators are now back on the street, increasingly protecting the State Insurance Fund. They are ready to deploy more and better strategies to deter, detect, investigate and prosecute workers’ compensation fraud. These strategies include conducting joint investigations with other law enforcement professionals, such as those who attended this week’s OAG Law Enforcement Conference 2014 and the hundreds of law enforcement professionals from around Ohio and the U.S. who gathered on April 17 in Columbus for the Electronic Surveillance and Equipment Symposium (ESES14), co-sponsored by SID and the Ohio State Highway Patrol. And, they are even better prepared as presenters to educate and inform stakeholders about how they may help us to deter and detect fraud, as we advised our blog readers last September. Ultimately, using what they learned at this and other training seminars, the BWC investigators seek to secure even more results than the $60.1 million in savings they identified last year, as outlined in our FY 2014 annual report. Rodney Whisman, of Wheelersburg (Scioto County), pleaded guilty Oct. 22 in Franklin County Court of Common Pleas to workers’ compensation fraud, a first-degree misdemeanor. The Ohio Bureau of Workers’ Compensation received an allegation that Whisman returned to work while collecting BWC disability benefits. Investigators found that Whisman did return to work as a laborer for a wood flooring company while concealing his activities from BWC, so he would continue receiving the benefits. Whisman was ordered to pay $5,000 in restitution, with a minimum of $2,500 up front; he paid $2,670. He was ordered to serve 14 days in the Franklin County Jail, but those days will be suspended as long as he pays court costs by Jan. 23, 2015. He must also pay the remainder of the $5,000 by Jan. 23, 2015 to avoid jail time. David Martindale, of Warren in Trumbull County, pleaded guilty Oct. 9 in Warren Municipal Court to one count of workers’ compensation fraud, a first-degree misdemeanor. Investigators with the Ohio Bureau of Workers’ Compensation’s Special Investigations Department began looking into the matter after receiving an allegation that Martindale was working while receiving BWC benefits. Financial records and interviews showed that Martindale did return to work while receiving workers’ compensation benefits. Martindale was sentenced to serve 180 days in jail, which was suspended for five years of probation. He was also fined $200 plus court costs, and ordered to repay $5,679.64 in restitution to BWC. If he violates the terms of his probation, Martindale will serve the jail time. At the Ohio Bureau of Workers’ Compensation, we see Fridays as an opportunity to highlight our Special Investigations Department’s efforts to deter, detect and prosecute workers’ compensation fraud. We started Fraud Fridays in August 2013 and each week, we share news releases, videos, articles and other updates. Watch fraud videos on our YouTube channel, BWCOhio. Thanks for reading, and for following and liking and subscribing to our updates. We appreciate it! We hope to see you next Fraud Friday. A person’s character may be best measured by how they act when they think no one is looking. BWC’s fraud investigators routinely find that criminals act as if no one is looking. However, it is increasingly likely that many people are looking and recording actions. The number of installed and active security cameras has increased, capturing more surveillance video evidence 24/7. These cameras protect the safety and security of all – both law-abiding citizens and criminals alike – in public areas, at workplaces and in residences. It only takes one video clip to bring a criminal to justice. Such was recently the case with one our fraud subjects. Last week, we reported that Glenn Jones of Cleveland faked a workplace injury that was captured on his employer’s security video. Jones can be seen stomping a hole in the wooden floor the night before he said he was injured. On the following day, he lowers his foot into the floor and lies down on the platform, feigning injury. Jones claimed he suffered multiple significant injuries. As part of a thorough investigation, BWC’s fraud investigators reviewed the security video provided by the employer. The video evidence confirmed that the injury did not occur as Jones had reported, and that a false claim had been filed. Jones pleaded guilty to and was sentenced Sept. 30 in Cleveland Municipal Court on one count of workers’ compensation fraud, a first-degree misdemeanor. As the security video shows, before lying down on the platform to complete his staged accident, Jones looked around. He apparently sought reassurance that he was not being observed by co-workers. Fortunately, he overlooked the security camera that was constantly observing him. For more details pertaining to our fraud prevention efforts, view our current annual report. Columbus – Ohio Bureau of Workers’ Compensation (BWC) Administrator/CEO Steve Buehrer announced today that four individuals were convicted of, or pleaded guilty to, charges related to defrauding Ohio’s workers’ compensation system in September 2014. These court actions are the result of investigations conducted by BWC’s Special Investigations Department (SID). Michael Meekins (Akron, Summit County) pleaded guilty Sept. 19 in Summit County Court of Common Pleas to one count of workers’ compensation fraud, a fifth-degree felony. BWC’s Canton special investigations unit received an allegation that Meekins was a professional wrestler engaging in wrestling matches while receiving disability benefits for an injury. Investigators observed Meekins participating in highly physical wrestling matches. He concealed his wrestling activities from both BWC and his physician. He was sentenced to community control for one year and ordered to pay $1,111.60 in restitution to BWC. Thomas Guardiola (Montpelier, Williams County) pleaded guilty Sept. 23 in Franklin County Court of Common Pleas to one count of workers’ compensation fraud, a fifth-degree felony. BWC received an allegation that Guardiola was working at a Montpelier hotel while collecting BWC disability benefits. Investigators found that he did so, while collecting $10,861.88 in temporary total disability between October 2012 and March 2013. Sentencing is scheduled for Nov. 13. Todd Smith (Columbus, Franklin County) pleaded guilty Sept. 25 to one count of workers’ compensation fraud, a fifth-degree felony. SID received an allegation that Smith’s business, A T Xpress, made a dishonored payment. Agents obtained payroll records and found that the business was underreporting wages to BWC. Agents interviewed Smith, who advised them he reduced the reportable wages to BWC in order to give his business a premium discount for a not at fault claim, which was filed against the business. However, when asked to provide the method of discount used in calculating the premiums, Smith could not provide an answer. Sentencing is scheduled for Nov. 12. To report suspected workers’ compensation fraud, call 1-800-644-6292 or visit bwc.ohio.gov. Check out our latest cases on our fraud blog, ohiobwcfraud.wordpress.com, follow Fraud Fridays on Twitter @OhioBWCFraud, or join in the conversation at www.facebook.com/ohiobwcfraud. View and share BWC’s workers’ comp fraud awareness video on our YouTube channel. Claimant fraud: Is all the world a stage for actors? In law enforcement circles, criminals are casually referred to as bad actors. While onstage, actors need audiences and are motivated by applause. However, the Ohio Bureau of Workers’ Compensation’s subjects pretend off stage, consider audiences optional and seek compensation, both as performers and as BWC claimants. Two recent cases illustrate this point. First, we had our musical impersonator, Ricky Gantz, of Elyria in Lorain County. An investigation by our Special Investigations Department and surveillance video revealed that Gantz played in a Beatles tribute band while receiving temporary total disability benefits. Investigators found Gantz continued sustained remunerative employment with Abbey Road between April 2012 and August 2013. The Industrial Commission of Ohio found Gantz was overpaid $13,277.24 in benefits. On the day of the hearing, Gantz’s attorney provided BWC with a check for the complete overpayment amount. On May 9, Gantz pleaded guilty to one misdemeanor count of workers’ compensation fraud. Gantz was fined $120 and ordered to pay court costs. And there was wrestler Michael Meekins, of Akron in Summit County. Our investigation and surveillance video revealed that Meekins was a professional wrestler who engaged in wrestling matches while receiving temporary total disability benefits for a lumbar sprain to his back. Investigators witnessed Meekins while he participated in highly physical wrestling matches that included numerous blows to his injured back. A convincing actor outside of the ring, Meekins had concealed his wrestling activities and ability to work from the BWC and his treating physician. On Sept. 19, Meekins pleaded guilty to workers’ compensation fraud, a fifth-degree felony. Meekins was sentenced to community control for one year and ordered to pay restitution to the BWC in the amount of $1,111.60. When they were out, especially at medical appointments, our subjects pretended to be injured and unable to work. In this sense, while their behaviors are dishonest, their acting is apparently convincing. On a stage or inside a ring, however, they ceased pretending and demonstrated their full capacity to work.